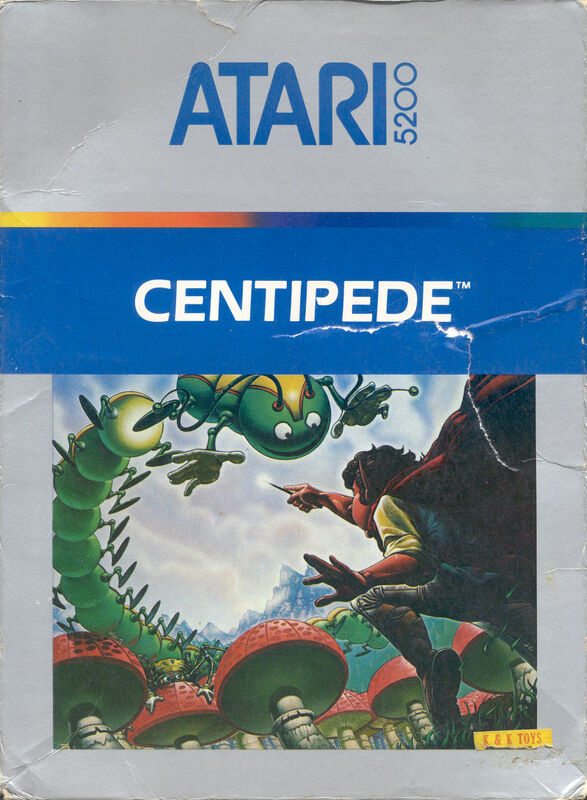 Centipede's premise didn't make much sense to me when I was nine years old. What the hell is this spaceship doing shooting mushrooms? I thought. Then I saw the box art for the Atari 5200 adaptation—in the days when box art made everything look much more compelling—and got it. Centipede: Origins, for iOS and Android devices takes you back to the mystical garden menaced by the hundred-footed bug, the spider, the flea and the scorpion, but your protagonist looks regrettably like the Travelocity gnome, not the dashing elf from the 5200 packshot. You can relive the fight of the arcade classic in one of four venues, give yourself a boost with some cute-but-not-essential powerups, and grind away for experience points that unlock more weapons and more efficient means of pest control. The game still plays like Centipede with a few variations. Your gnome, of course, fires automatically. 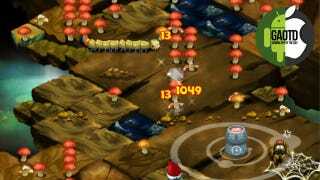 Mushrooms are destroyed with two shots instead of four, making it easier to clear the playing field. The scorpion is smaller and his entrance is less dramatic, making it harder to tell where the poisoned mushrooms are. These will send a centipede headed to the bottom on a slower diagonal path instead of barreling straight down. The flea also doesn't accelerate after getting hit with the first shot, making him more of a pest than a real threat. Centipede: Origins' later levels are unlocked with the coins you earn for progressing (or collecting as foes drop them) but this is a minor, minor requirement. I was able to see all four levels after about five minutes of play. The power-ups are interesting but not really critical to success, given how, in straight gameplay, this Centipede is much easier than its ancestor. Its difficulty lies in the one-hit/one-life consequence the game lays down. There's a bit of an annoying wait as the game cycles you over to a retry window. Aesthetically, the colorful fantasylands and cartoon typefaces are mixed with a whimsical musical score that I didn't really care for. The presentation will barely remind you of the original game, with its pulsating drumbeat of insect footsteps and laser-show colors over a black background. If that's what you want to play, you won't find it here. I played Centipede: Origins on an iPhone and ended my session thinking this is more of an iPad game. You move your gnome easily enough, with a finger directly underneath his position. But the screen is so small as to make some of the details of the playing field difficult to see or understand. And when the centipede reaches the bottom and begins to crawl back up, your finger will be obscuring his path as you evade him, the spider, and anything else on the field. Despite these quibbles, Centipede: Origins fulfills the core expectations of its namesake, tones down the in-game difficulty while balancing it with a hard, single consequence, and at a dollar delivers plenty enough replay value to be a solid timekiller.